Interior was exhibited at the Tin Sheds Gallery in Sydney in 1998. Interior is an endless and gradually shifting drone-like texture, presented in three different versions. It explores relationships between architectural proportion and sound, and between pitch and the ears' experience of space. 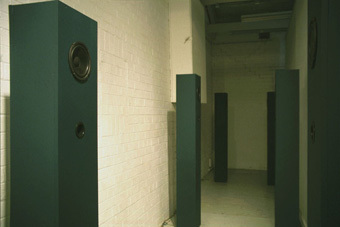 The sound of Interior was generated using a computer model of a resonating room. 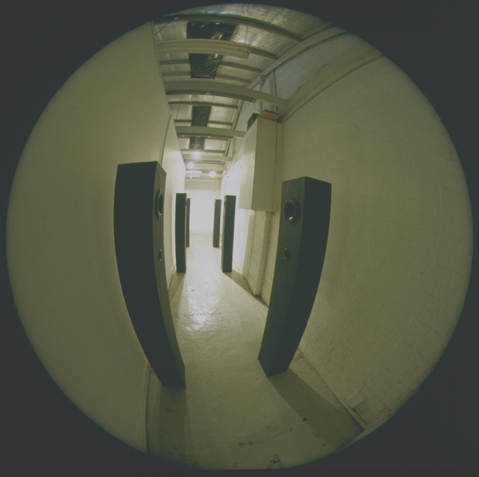 A pair of ears follows a wandering path through this simulated room, encountering different resonances as it moves. The sound at each of these ears is reproduced by the loudspeaker pair. The resulting sound is a deep and rich mass which gradually evolves. Here is a short extract from Interior. It will only be audible over loudspeakers with good bass response. Contact Densil if you are interested in obtaining a CD recording of Interior.